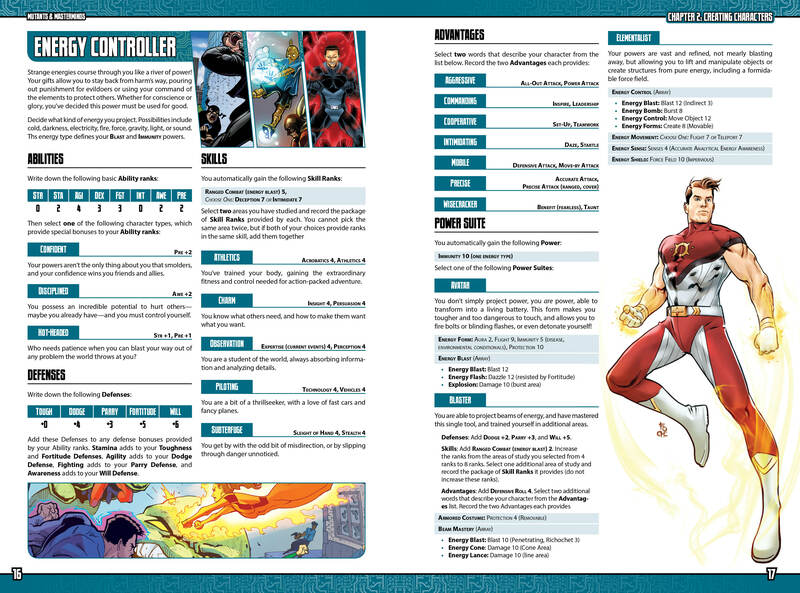 As Mutants & Masterminds developer Crystal Frasier is demonstrating in previews leading up to pre-orders, The Basic Hero’s Handbook has a lot to offer both old and new players interested in the World’s Greatest Superhero RPG. “But what about Gamemasters?” you ask. Fear not! As it happens, The Basic Hero’s Handbook (or M&M Basic for short) has a lot of offer M&M GM’s as well, including those of you who may want to start running your own games. What sorts of things will long-time and new Gamemasters find in the book? The Doom Room: How to run all of those “training exercise” scenes where the heroes cooperate against a fiendish simulation, or compete against each other. The material in this encounter also does double-duty in supplying game mechanics you can use for various villainous traps! The Heist: The classic robbery scenario, including what the crooks are stealing, the potential for innocent bystanders in harm’s way, and ways the thieves may use to cover their escape when the heroes try to thwart their heist. Variations include how to mix-and-match some supervillains and different kinds of heists. The Rescue: A falling jetliner, a runaway train, people in danger and heroes to the rescue! How to handle rescuing people endangered by these and similar problems, along with many variations that can turn them into even more complex encounters, such as rescuing a falling passenger jet while also dealing with the villains who damaged it! Disaster! Looks at a different sort of rescue encounter, heroes saving people in danger from a catastrophe. This can range from a building on fire or damaged in a quake, to a storm or some other disaster, and sets up how to stage rescues and give the heroes challenges that are not necessarily things they can punch their way through. You can use these encounter archetypes as building blocks for your own superheroic adventures or time-savers in your own adventure design, since the essential work has been laid out for you. 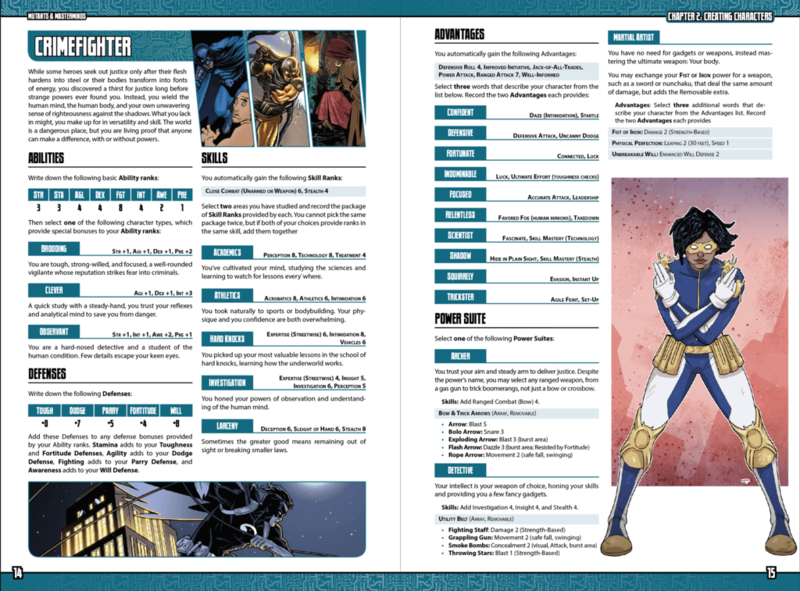 M&M Basic offers a set of ready-to-run villains with a variety of different power levels, from 8 to 15, complete with easy-to-read character sheets detailing just what the villain’s powers do in clear terms. For example, take a look at the new Luna Moth, a daring, flying thief with gossamer wings and chemical cocoons to challenge your heroes. Other foes described in Basic terms for Gamemasters include the Power Corps, the Battle Brothers, the mentalist Mindfire, the space bounty hunter Loma Slife, Malador the Mystic, and the sinister Overshadow! Plus GMs get a variety of ready-made monsters and minions to round out the villains and to put between them and the heroes. 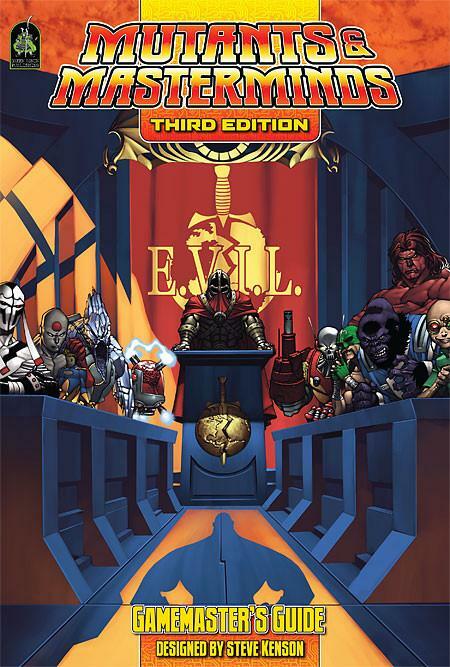 Plus the Basic Hero’s Handbook includes a complete M&M adventure, Shadows of the Past, making use of the villains and encounter building blocks provided in the book. 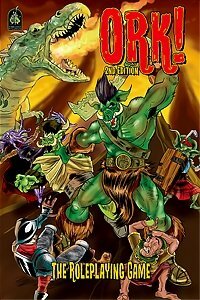 You can play through this adventure to introduce a group to the game or kick off a new M&M campaign, and use it as an example for building your own exciting adventures. 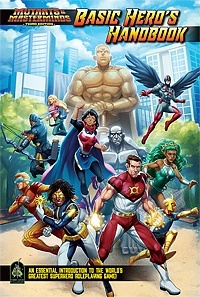 Combine this with GM advice and reference material and The Basic Hero’s Handbook has everything a group needs to get started playing the World’s Greatest Superhero RPG! 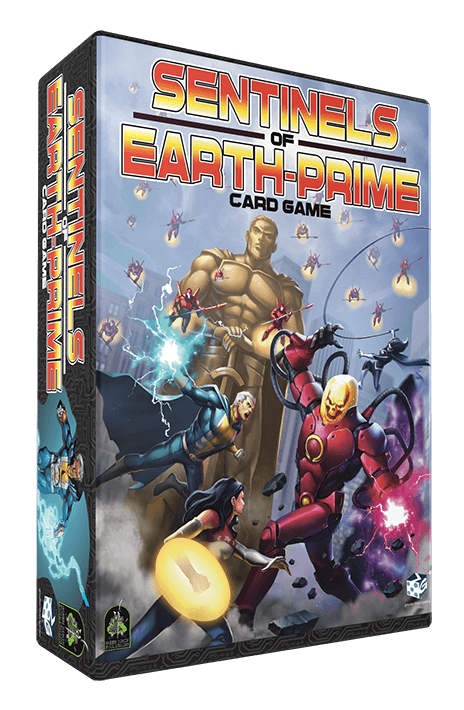 The past few months have been focused on the design and playtesting of the decks of Sentinels of Earth-Prime and I’m happy to report that it’s going great. The fourth version of the playtest decks are currently having their tires kicked and everything is coming together nicely. 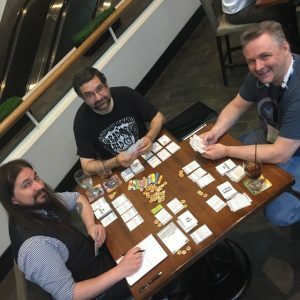 Earlier this month, both Green Ronin and Greater Than Games were at the Origins Game Fair in Columbus, Ohio and this gave us a chance to get together to talk about the business side of things and do a playtest together. This was the first time we’ve actually had the whole team in one place so we were able to cover a lot of ground and make sure everything was on track for the next stage of development. In addition to the boss Ronins (Nicole, Hal, and myself), we had Steve Kenson (designer of Mutants & Masterminds and creator of Earth-Prime), James Dawsey (art director for this project), and Christopher Badell (Greater Than Games, designer of the Sentinels games). The following day Christopher, James, and I met up for a playtest of Sentinels of Earth-Prime. Playtest at the Big Bar on 2! I played Lady Liberty, James played Dr. Metropolis, and Christopher played Lantern Jack in a battle against Argo the Ultimate Android in the heart of Freedom City! Argo has powers that mimic those of members of the Freedom League, so this was a challenging fight, particularly with none of our characters being big damage dealers. Nonetheless, we prevailed, saving Freedom City once again! Lady Liberty, beacon of freedom! 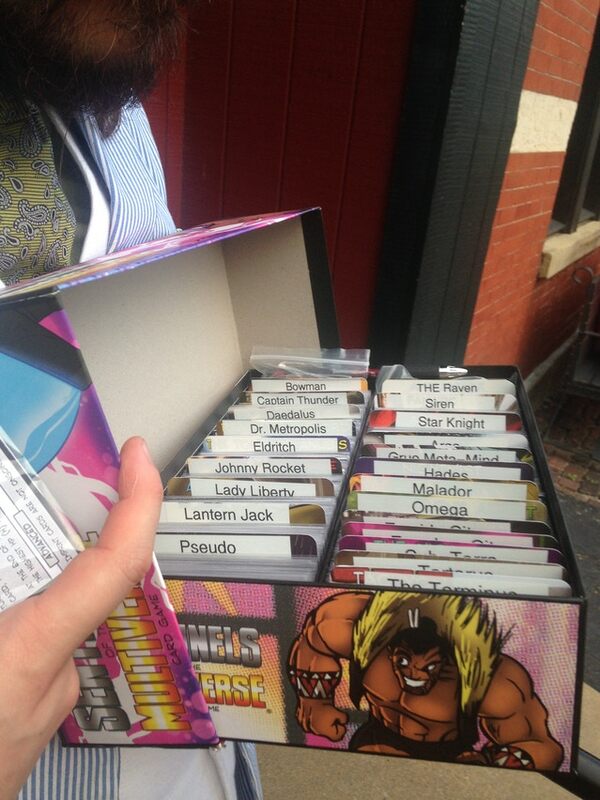 As Christopher designed literally every card of Sentinels of the Multiverse, I knew his new decks would be good. My primary concern was that they capture the right feel for the Earth-Prime characters. Back in April we had Steve go over the decks and give Christopher some notes on story and character. 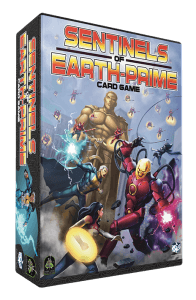 That and the continued playtesting have honed the characters so they provide a fun Sentinels experience and a great Earth-Prime experience as well. At this point the major design work for the game is done, so it’s a matter of nips and tucks to ensure the decks are just right. We said previously that you could expect the game early next year and that is still the case. Right now we are in the lead up to GenCon, our biggest convention of the year, so things are in overdrive at GRHQ. 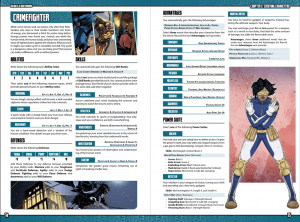 Among other new releases, you’ll be able to get the Basic Hero’s Handbook for Mutants & Masterminds (check out Crystal Frasier’s recent Ronin Round Table to find out more about it). https://greenronin.com/wp-content/uploads/2018/06/03b8298a9a9a165fd9b603f10badbb73_original.jpg 852 639 Chris Pramas //greenronin.com/wp-content/uploads/2017/07/RoninBanner-1.png Chris Pramas2018-06-25 11:46:082018-06-25 11:46:08Ronin Roundtable: Playtesting and Origins! As we put the finishing touches on the Rogue’s Gallery, the Mutants & Masterminds Basic Hero’s Handbook was slowly percolating in the background. Now that it is nearly ready to ship to the printers as well, I’m happy to show the results of several months of work and writing! Mutants & Masterminds is a great game with a robust ruleset built over 16 years and three different editions. 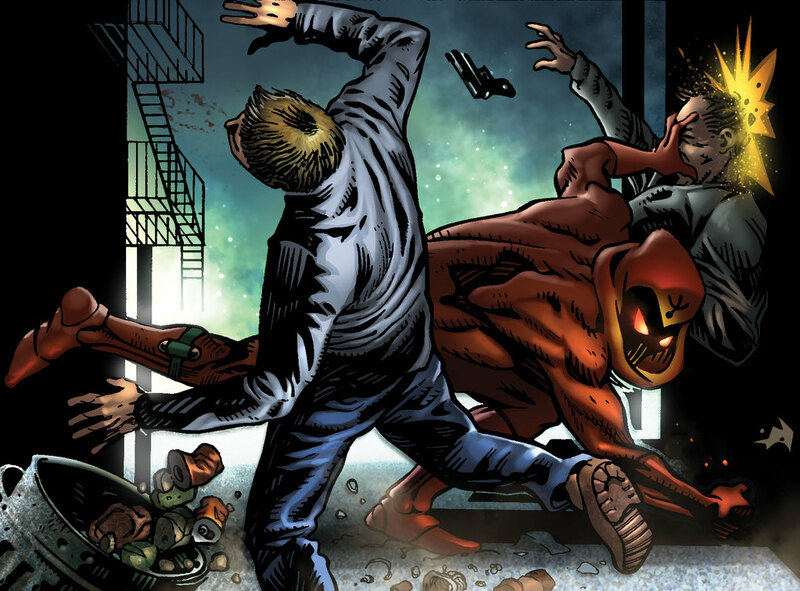 It’s flexible enough to handle almost any genre of comic book adventure, from traditional tights-and-fights books to street-level vigilantes to cosmic weirdness to mundane human agents facing off against the unknowable. But that flexibility brings a certain amount of jargon and a learning curve that can be off-putting for new players. Among the first challenges we decided to tackle to make a newbie-friendly rulebook was character creation. The Deluxe Hero’s Handbook offers a wealth of choices for fine-tuning your character to build exactly what you want to play, but for brand new players that freedom can be intimidating. Option paralysis is one of the most commonly cited problems players new to M&M report, followed closely by the amount of number crunching character generation required. The Quickstart Character generator is a perfectly solution for intermediary players, but we wanted a solution for those picking up Mutants & Masterminds for the first time. Our solution is the Basic Archetype, which boils character generation down to a handful of choices about your character’s theme, personality, and history. 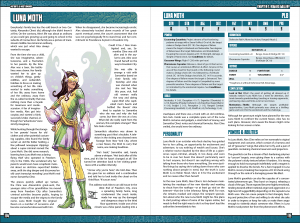 With one of the book’s eight basic archetypes and a character sheet, even brand new players can be game-ready in ten minutes! Each Basic Archetype starts with a brief overview of the concept. Each Archetype has a base suite of Ability ranks and Defense ranks, which you can tweak by selecting a character type. Most come with a few basic skills, but ask you to decide who your character is to determine the rest. Likewise, selecting Advantages is rolled into deciding a few personality traits that help define your hero. 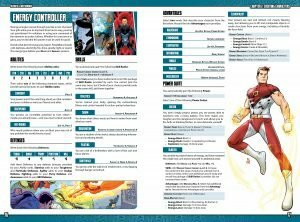 Finally, each Basic Archetype lets you select one of three Power Suites that define what exactly puts the “super” in your super hero. This is Solar Ray, or just Ray to his teammates. He appears—alongside his friends Anansi, Ultra, and Pinnacle—in the Basic Hero Handbook’s tutorial comics. 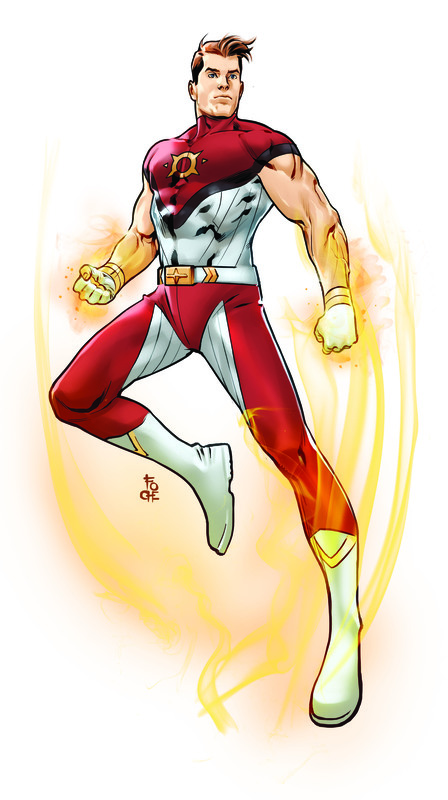 The Energy Controller’s Ability ranks focus mostly on being tough and fast, with the cocksure attitude and powerful presence that usually accompanies the ability to throw fireballs. Their skills options give you some classic comic book staples for energy-wielders, letting you help personalize you hero as say, a lothario test-pilot or a watchful commander. Because Energy Controllers are more defined by their powers, they don’t receive as many Advantages as most heroes, but you still get some flexibility in deciding if your hero is a wisecracking brawler, a cool-as-a-cucumber tactician, or a terrifying force of nature. Finally, their Power Suite choices give you choice of what kind of comic book exploits you want to embody: The Avatar is your classic Human Torch, able to transform into a living incarnation of your element; the Blaster, on the other hand, is a classic one-trick pony who can only do one thing, but does it very, very well (and gets some extra Skills and Advantages, since they’re not out there hotshotting all the time); the Elementalist splits the difference as a master of energy, able to control and wield their element with extraordinary skill, but not transforming into it. 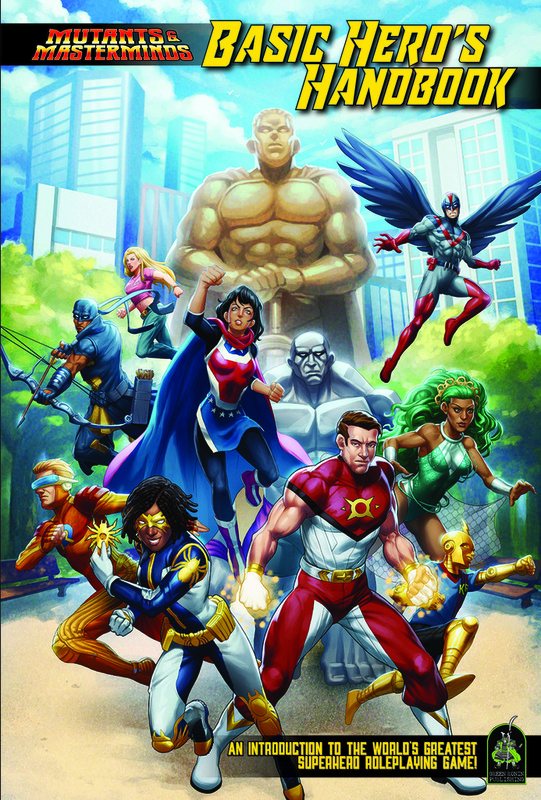 The Basic Archetypes are fast, easy, and flexible enough to make each hero feel personal, obfuscating the math and overwhelming choices while still giving players a standard 150 power point, Power Level 10 starting character they can bring to the table alongside veteran players who create their characters using the rules found in the Deluxe Hero’s Handbook! 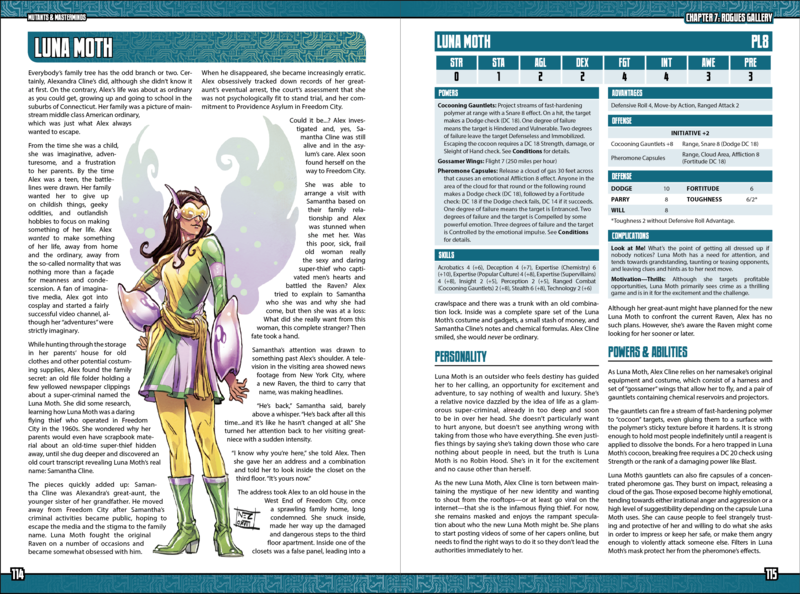 The full basic Hero’s Handbook will be available in print later this summer at GenCon. Hope to see you all there! Ronin Roundtable: Coming soon from Nisaba! A whole year of Nisaba? It’s hard to believe, but it has indeed been a year since we announced Nisaba Press, Green Ronin Publishing’s fiction imprint. We’ve published some great fiction in that time, although we’re just now getting started. If you’ve missed our previous offerings, don’t worry! They’re still available on our site: Brandon O’Brien’s witty, sweet Blue Rose tale of two thieves in an endless cycle of vendettas; Kid Robot’s first day of school, by Eytan Bernstein; and Clio Yun-Su Davis’s Blue Rose caper. You can even read Crystal Frasier’s Mutants & Masterminds story about Centuria, Lady Liberty, and robot dinosaurs…for free! And while we’ve gotten off to a good start, Nisaba has a big year ahead, too. Dylan Birtolo returns with a new Freeport adventure featuring Red Alice and a sinister amulet. 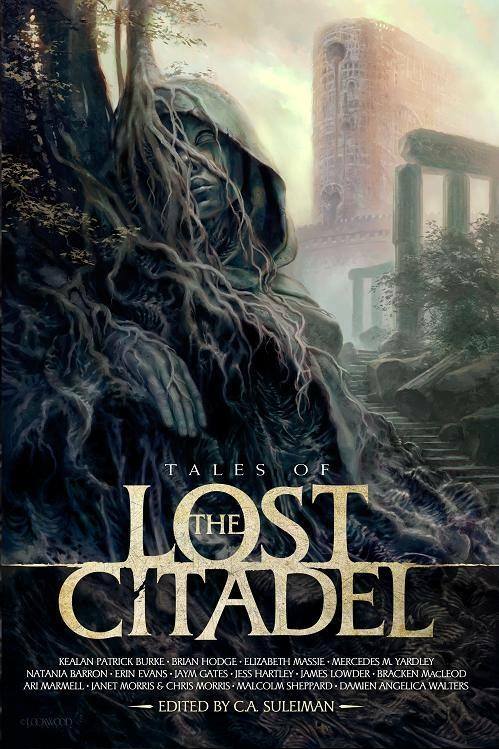 Featuring fights through the Freeport sewers, chases over the high seas, and plenty of cult conspiracy, this series of three stories will release over the summer. 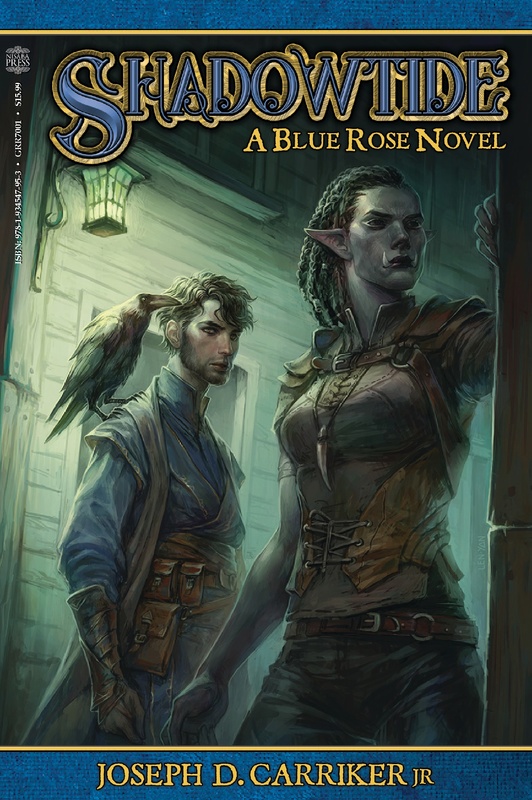 Rhiannon Louve continues her beautiful Blue Rose story of a grieving Rose Knight who finds a new lease on life and a new purpose in her courageous partner, a new Rose Knight with unusual talents. Michael Matheson joins the Nisaba roster with a pair of tales, one for Blue Rose, and one for Mutants and Masterminds. Richard Lee Byers tells another Mutants & Masterminds story about a woman fighting a terrible internal battle and the clairvoyant hero hunting her. We’ll be debuting some new settings for our stories, too. Some will be stand-alone adventures to offer campaign ideas for our settings, while others will tease new settings we’re working on. And if novels are more your thing, we have two novels coming this year! Joe Carriker’s Shadowtide is a sleek and sinister adventure through the political and cultural battlegrounds of the world of Blue Rose. Aaron Rosenberg brings in the first Mutants & Masterminds novel, featuring a disabled woman taking over her grandfather’s superhero cape while a bitter villain seeks vengeance. Stay tuned for big news from the Nisaba world as we wrap up our first year and head into what we hope is a long and bright future, because we’ve just started on our plans. https://greenronin.com/wp-content/uploads/2018/04/GRR7001_Shadowtide_Flat-300DPI_preview.jpeg 2048 1363 Jaym Gates //greenronin.com/wp-content/uploads/2017/07/RoninBanner-1.png Jaym Gates2018-04-23 08:28:552018-04-23 08:28:55Ronin Roundtable: Coming soon from Nisaba! I’ve used the past few Ronin Roundtables to preview products and plug some of our talented and ingenious third-party publishers, but this week I want to talk about a subject near and dear to my heart: Making the system work for you. I’m a great lover of homebrew—systems are there to work for you; you’re not there to work for them. If a rule doesn’t do what you want, then change it or toss it. No mercy. 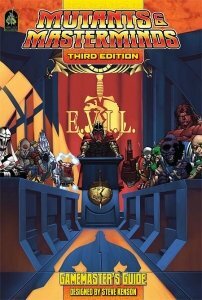 But what if you find another rule you really like, and want to roll it into your Mutants & Masterminds experience? 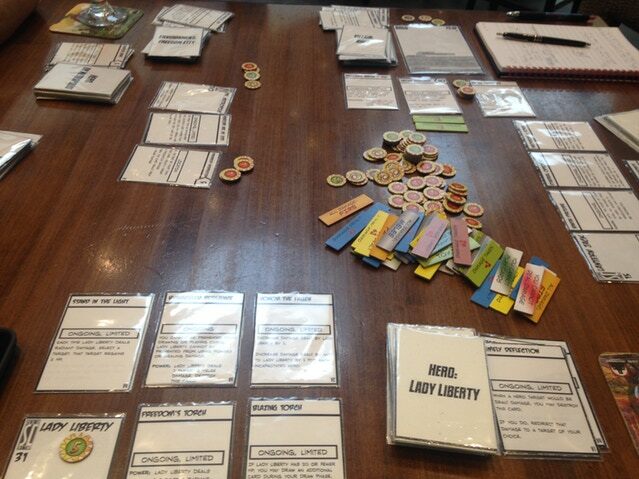 Or you want to add some of your favorite elements of Mutants & Masterminds to another system? For these tasks you need the hands of a surgeon, not the axe of an executioner (an axecutioner, if you will). Let’s look at one of my favorite elements of Green Ronin’s Adventure Game Engine (AGE) system: Stunts. Stunts add a lot of cinematic fun to a game, with players able to show off and get creative in the moment. I like running a cinematic table for my superhero games, so I’m interesting in borrowing from AGE for my own M&M games. 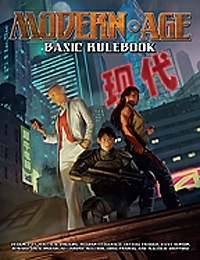 I’m going to use the stunt lists from pages 36 and 79 of the Fantasy AGE Basic Rulebook, but each book for the AGE system (Fantasy Age, Dragon AGE, Blue Rose, and the upcoming Modern AGE) have their own slightly-modified stunt lists to best suit their related genres. Before we figure out how to import a rule, let’s take a look at what stunts do and why, and see if anything in Mutants & Masterminds is already doing the same thing. The stunt system fleshes out interaction and exploration scenes with new tactics, giving some heft and direction to what is otherwise just a mechanical skill check. It lets the player character do impressive or unexpected things, even with relatively low die rolls. 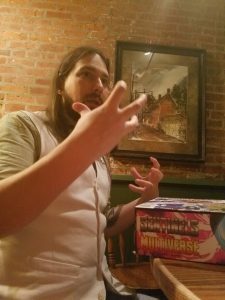 Mutants & Masterminds largely relies on player creativity for that (which is fine) and freeform rulings from the GM. You get a little definition in success by measuring how many degrees of success you score on a check, but even that is largely abstract. 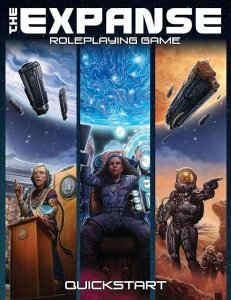 So the exploration and roleplaying stunts could shift a little of the power and the burden of creativity from the gamemaster to the players for skill checks. Sounds good. But the stunts also let PCs try out innovative attacks and strategies in combat, and Mutants & Masterminds already has a fairly robust combat system. Stunts are how the AGE system handles the actions—taunt, disarm, power attack—that M&M handles via actions and maneuvers and Advantages. The stunt lists from Fantasy AGE provide a few additional attack options, like punching through armor and attacking a second time, that aren’t generally options in M&M for balance reasons. Still, they could work if we wanted to drop the maneuvers as options for our heroes, or turn any remaining maneuvers into new stunt options. So if we import the stunt rules, our easiest option would be to only adopt the roleplaying and exploration stunts. We can import the combat stunts, too, but that means tinkering with the core system a little more under the hood. If we want the stunt system to work, then our PCs need to be able to generate stunt points. Obviously we don’t want them to generate stunt points on every roll—that would slow the game down and take away the semi-random element that makes stunts feel like cool stunts and not just a part of your character’s abilities. The AGE system handles this by rolling doubles on 3d6, and the Mutants & Masterminds Gamemaster’s Guide gives us some suggestions for using 3d6 for your games instead of a d20 and the benefits and drawbacks involved, so that could work. We could also use a page from the existing Mutants & Masterminds rules and say that PCs generate stunt points when they score an additional degree of success than they need; they could either roll a d6 to determine how many, or keep it a straight conversion: trade in one degree of success on a skill check for 3 stunt points, or two degrees for 6. This second option means PCs need to roll well to use stunts, losing that feel of doing cool things even with an average roll, but is more in line with how the Mutants & Masterminds rules already reward players. There’s no one right answer, so weigh the pros and cons of both against your table’s play style. If you want to use new rules to replace what Mutants & Masterminds already does, that’s a little trickier. In the case of maneuvers, PCs can plan ahead and accept a penalty to their action to get a different effect. The AGE system reverses the order, letting players look at their dice results before narrating what the exact effects are. Using both AGE-style combat stunts and keeping the existing list of actions and maneuvers is probably the easiest, but then what happens when a PC scores stunt points on their disarm roll? Ignore it? Let them add a stunt? This method will slow combat down a bit, as if gives PCs more choices, but if your table is pretty quick with the rules already it might be the easiest. If you want to replace certain rules in favor of stunts, you can drop the following actions and maneuvers: Defend, Disarm, Trip, Demoralize, Feint, and Power Attack. You might also want to turn the Grab, Recover, and Smash actions into stunts of their own (costing maybe 4, 3, and 2 stunt points, respectively). Once we do that, how do we handle Advantages like Improved Trip? Do they let you simply use the stunt without spending stunt points? Or is it more balanced to have them reduce the cost of their related stunt by 1 SP? Is that too weak for an Advantage? Should we just eliminate those Advantages? Or it might be cool if they let a player “bank” unused stunt points for that specific maneuver to use when they wanted to—sort of like “charging up” a special maneuver or leading their opponent to give them an opening—but what happens if the PC charges up several feats and unleashes all their special maneuvers in one big disarm-trip-power-attack? That last option sounds pretty cool and in-theme for a superhero game, so let’s try that. Finally, we take our vague idea and read through what exactly we’re doing, and tweak the specific rules where we need to. For the exploration stunts, The Object of Your Attention, The Upper Hand, and With a Flourish all provide a mechanical bonus to other checks, and Mutants & Masterminds using a different difficulty scale than the AGE system. A +3 initiative bonus seems fine, but let’s increase it to +4 to line it up with the Improved Initiative Advantage. But Object of Your Attention and With a Flourish bth seem like they’re adding a circumstance bonus, so let’s say they grant a +2 bonus, or increase a +2 bonus to +5. The roleplaying stunts have a few more rules elements. For Sway the Crowd, we might say the extra influence in limited to anyone with an Awareness lower than your Presence. Jest seems like a ripe target for a Will resistance check, say with a DC equal to your Presence + 10. Flirt sounds like it would call for an opposed check of your Presence skill against someone’s Will defense or Insight skill. And finally, Tower of Will seems like it’s adding a circumstance bonus, so again we’ll bump that up to +2. The list of combat stunts are where things start to get a little more challenging. We’ve already talked about replacing the rules for stunts like Knock prone and Disarm with their related action rules. The Rapid Reload stunt doesn’t really apply to Mutants & Masterminds, which doesn’t track ammunition. Stay Aware seems like an easy fix, giving a PC a free Perception check as a stunt. Mighty Blow and Lethal Blow seem like they’d raise the resistance check DC of your attack by +2 and +5, respectively. Pierce Armor could be trouble, as M&M doesn’t have specific armor rules; we could say it lowers the target’s toughness save by –2, but then it becomes mechanically identical to Might Blow, so maybe we can go with ignoring a target’s Impervious rank on the related defense—this will let smaller heroes still have some chance of affecting bricks from time to time and make their efforts feel less futile. Lightning Attack lets PCs unbalance the action economy, so my first instinct is to limit it to a single standard action rather than a full action, and increase the cost to 5 SP (this also lets us figure out about how many SP a Hero Point is worth, if we later want to let PCs trade a Hero Point to generate SP). For Mutants & Masterminds, Dual Strike actually seems less prone to abuse than Lightning Attack, so let’s reduce the SP cost to 3. The Seize Initiative stunt seems good as-is. That finishes out the basic combat stunts, but maybe we want to add stunts for the Grab, Recover, and Smash actions as well, more or less using the rules for the existing actions as-in, but assigning them an SP cost. 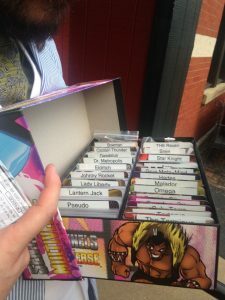 Make your own updated list of your stunts and their costs and print out a few spare copies for players so they have quick and easy access during play. Any time you want to test out new rules additions or changes, it’s best to test them out first with a few friends and quickstart characters. Rules that seem innocuous during the design phase might end up very unbalanced in actual play, and ideas that seemed fun might be confusing or drag things out. For example, in test play, giving PCs with the appropriate Advantages the ability to bank stunt points for later didn’t really see any use; my players felt like they weren’t getting any benefit for the Advantages, because when they generated stunt points, they wanted to use them now, not save them up for a later attack they may never even get. So back to the drawing board for a tweak, and now let’s say the various combat Advantages give you a 1 SP reduction in a cost of their specific maneuvers. This might means a little tweaking on character sheets (for example, you might break up Power Attack into Improved Mighty Blow and Improved Lethal Blow), but it kept things buzzing along at the table, and even though the Advantage seems minor in its stock description, it let the players have a lot more fun slinging their stunt points around. One PC unleashing a Knock Prone, Mighty Blow, and Taunt for just 3SP sure felt a lot like reading a certain spider-themed masculine hero in my childhood comics. Over all, they roleplaying and exploration stunts brought a lot to the game and I’d use them again.The combat stunts felt a little less necessary, but were still fun once we got used to them. We ultimately settled on trading in one degree of success for 2 SP, trading two degrees of success for 4 SP, three degrees for 6 SP, or trading in a Hero Point for 4 SP (5 SP let PCs stack a little too much into a single attack, and it meant PCs could spend a Hero Point to “buy up” the DC of their first attack by +5 with lethal Blow, which tended to shut down fights fast).I personally preferred adopting the 3d6 dice pool mechanic for all our M&M rolls, but my players like the swingy-ness of the d20 more, and ultimately it’s about what makes the game more fun for everyone. House rules aren’t really any different than official rules; the intention either way is to have the best tools to tell the stories you want to tell. So go nuts; pick and choose what you like and makes things more fun for you and your players. Always be ready to adapt, though, and be consistent with changes you make—carrying them forward for the rest of the session and beyond until they prove to not be working or stop being fun.